9:30 am or 10 am, dependiing on the provider of the service. The activity is most rewarding on a clear, sunny day. We are comparing Castel Sant' Angelo and St. Peter's Square Tour Prices from leading ticket suppliers and Try to find you Cheap tickets prices on the market. An introduction of a few iconic points of interest closely related to the history of Rome. Ponte Sant' Angelo is one of the few most beautiful bridges in the city, located near Castel Sant' Angelo, featuring outstanding works of art. Before the construction of the Castel Sant' Angelo, the Mausoleum of Hadrian, a great emperor of Rome, occupied the site. Castel Sant' Angelo used to be a fortress, a residence of popes and a prison. Visitors also walk Pasetto di Borgo, a tall walkway connecting the castle to Vatican. In Square of Saint Peter, Vatican, visitors admire semi-circular wings embracing the square and views of the Saint Peter's Basilica. The guided tour is especially suitable for travelers interested in art, grand structures and military strongholds. Joining the activity proves interesting to people curious about how popes spent their days throughout history. Admirers of Bernini's life and work also find the guided tour very interesting. Your Experience With Castel Sant' Angelo and St. Peter's Square Tour? Walk on Ponte (Bridge) Sant' Angelo, one of the most beautiful bridges in Rome, and admire sculptures of angels. Enter Castel Sant' Angelo, walk its corridors and explore papal quarters and prisoner cells. See lavish papal apartments featuring beautiful frescoes and other ornamentation. Learn about Hadrian's Mausoleum, the tomb of the big Roman emperor that assumed the same place. Take a walk along an elevated walkway that was in service of popes throughout centuries. 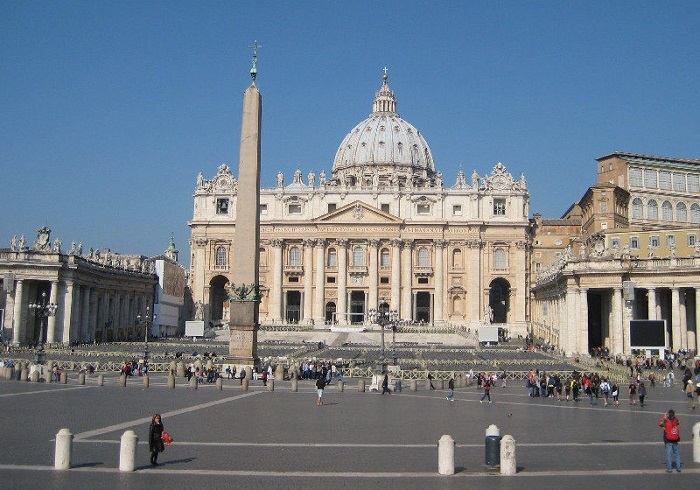 Enjoy a tour of Saint Peter's Square in Vatican and admire its semi-circular wings featuring extraordinary sculptures. What Castel Sant' Angelo and St. Peter's Square Tour Includes? Admission fees and a guided tour of a few extraordinary sites in Rome. An expert tour guide that is a historian of art. Castel Sant' Angelo follows the similar outline of the former Mausoleum of Hadrian. Angels on Ponte Sant' Angelo hold items related to the passion of Jesus Christ. A statue of Archangel Michael tops the Castel Sant' Angelo. Travelers Reviews about Castel Sant' Angelo and St. Peter's Square Tour? The vast majority of participants enjoyed the guided tour. They state that the information they received and the sites they visited make this tour one of the must-do things in Rome. The reviewers commend the conduct and knowledge of their assigned guides for the most part. Some of the travelers state that views from vantage points they accessed are excellent. Comments indicate that visiting the related attractions with acquired knowledge about them is much more rewarding than simply seeing them. The activity isn't suitable for people suffering from mobility issues. Disclose your printed or mobile voucher to take part in the guided tour. You receive a full refund for canceling the order at least 24 hours in advance. Part of the tour takes place outdoors, so dress accordingly to weather conditions. There is a security checkpoint at the entrance to the Vatican on the walkway. Ponte (Bridge) Sant' Angelo, Rome, if not specified otherwise.